Friends, fiends, fops and floozies, the world is your oyster and inside the shell is a fully flexed mussel known as the Cowboys. They’ve been called Indiana’s finest but truly the Mid-West’s Most-Wonderful is the name that best sums up what the Cowboys are all about. Oh did I mention that I (Chris “Twist” Kramer) have recently joined this band? As of last spring, I have become the sometimes-second guitar playing member of this beast of a band. I met the Cowboys when they joined a Nobunny tour from Canada to Florida and probably some other places and in addition to seeing them play every night we secretly listened to their tapes in the van, too. Wow what a band! Such a rhythm section! What a singer! Dig the production and tones! “If only,” surely someone thought, “there was another dude just strumming along in the background!” Well, anonymous nobody, I am the answer to your misguided wish. Okay with that rambling preamble out of the way, we present to you “The Bottom of a Rotten Flower,” the first Cowboys album featuring 5 Cowboys. Recorded last summer at Bloomington’s Russian Recording (aka Li’l Bub Studios), this is 16 songs of heartfelt heartache and bombast plus catchy tunes, clever lyrics and oh yeah did I mention that rhythm section? You can find records and CDs from Feel It Records and even cassette tapes (remember those?) from Burger Records. You can also find the Cowboys coming to a city near you! Here are some tour dates where 4 or 5 Cowboys will be performing some of these songs and also some older ones too. Hello there, I’m just dropping a note to tell you all about the brand new Slushy album. Oh yeah, you probably want to know what kind of music this is, huh! Well, it’s kinda like rock and roll, sort of. I mean, there are guitars and bass guitars and drums and things in the instrumentation department, and I sing with my voice on every song, sometimes with lots of words and sometimes only a few. You can dance to a lot of the songs if you try hard enough. The songs are “about” stuff, like they have a message, ya know? Like one is about living with octopodes in the ocean, and one is about how I like flowers but usually just when they’re growing in the dirt, and another one is about how the music on the radio is really good and has a good beat and is easy to dance to. Oh and there’s also one about driving in a car, two about driving in a car actually, I was gonna write a third one about driving in a car but the car broke down in the middle of the second one. Oh well! Shimby really likes the one where I say “love so true” a lot of times. That one’s called “Love So True”. Tara likes the one called “Cindy Says”. I recorded all the songs at my home in Chicago using only 2 microphones so it has that classic “thin” sound that the audiophiles hate so if you hate audio files you’ll love this album! That’s just a little joke but it’s pretty good so I’ll keep it. Everything was recorded over about 2 weeks in May and I finished it the day before my birthday at like 8 pm then I buzzed my hair so this is a “long hair” album even though my hair is short now, FYI. Yes, it’s hippy stuff. I already mentioned the song about flowers. Did I mention drums? I played the drums (and everything else too) so if it gets a little off rhythmically speaking you know why. Let’s see, I’m forgetting something… Oh yeah! Kieth Herzik did that artwork and he sure did do a good did! Take a gander at it! Octopodes and flowers, together at last! (I read in a book somewhere that the plural of octopus is octopodes and I’m trying to incorporate it into my vocabulary but how often do you get to talk about octopodes? Not very often unless you’re a marine biologist or a sailor or a janitor at a zoo, I guess.) And Shimby McCreery mastered it, same fellow who mastered Pastime Gardens so you know it’s gonna sound great! When I did the layout for the cassette tapes I put a logo for Tripp Tapes and a logo for Rubber Vomit Records on the back bit, so that’s cool, like I got record deal or something! And Scott Beard at Audio Duplication Services made the tapes and they are real and they didn’t get stolen just arrived a week late but that’s not Scott’s fault, they do great work at ADS! Give them a call for your next tape run! They even shrink wrap! audiodups.com. You can get a tape from me next time you see me. Or just download a tape from the internet. I put the whole thing up on bandcamp and Max made sure I didn’t put any typos in the lyrics which I also included on the bandcamp thingy. It’s right here go ahead what are ya waiting for? A written invitation from the Queen? Well that’s understandable but it might take her a while to get around to it, she’s very busy what with all the waving she has to do. Did I tell you I’m paying myself by the word? Anywho, that’s the scoop on the new Slushy album. It’s called Fun Cunumdrum, I produced it and played all the instruments and wrote all the songs and just wrote the word sand instead of song but then changed it. It’s out on Tripp/Rubber Vomit, it’s really catchy, you’ll probably like at least one of the songs, there are 14 songs total and I didn’t write the word sand again except for just now but I meant to. Hello, I’m Chris Twist is the new album by Chris Twist. Available for streaming and downloading as of April 26, 2017, and available for purchase via Tripp Tapes as of May 19, 2017. 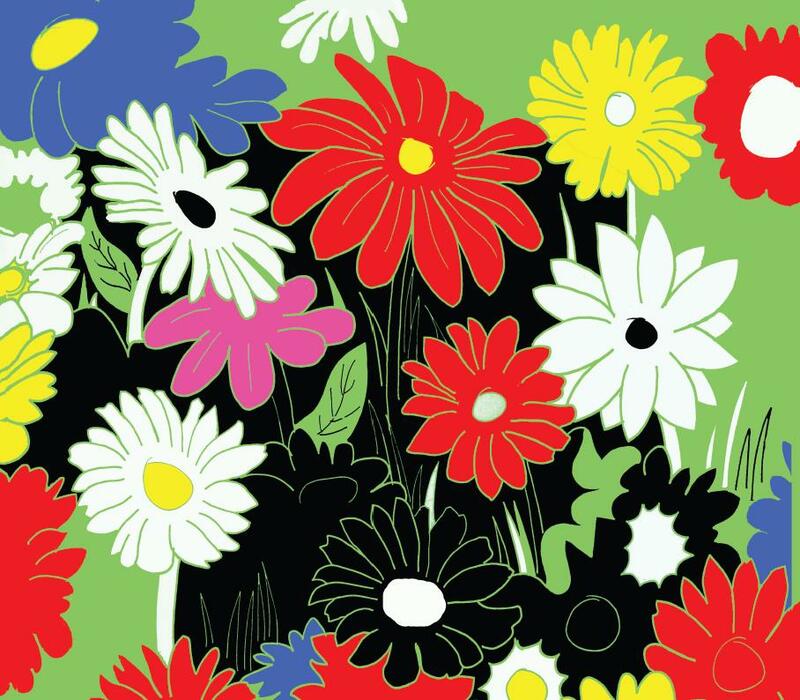 14 songs about flowers, rainbows, jokes and dreams, all from the brain that brought you Slushy and The Lemons. Do you enjoy it? Hello! Here’s a little tape I made that’s out today on Tripp Tapes. “Slushy Presents: Nuggish: Artyficial Originals from the First Slushydelic Era” is a garage rock hip hop album: with colons. I got the idea while killing time on tour and discovered I had a music app on my phone that makes loops. So I made some loops then came up with new hooks. Then I drew the drawing that graces the cover. I really like how it all came out, and I’m putting it on the internet for 24 hours, then it’s coming down so I don’t get sued and then famous. 100 cassettes will also be for sale at shows, on slushy.bandcamp.com and at Bric-A-Brac Records. Debut Slushy LP “Pastime Gardens” Is Out! Filed under: Releases | Comments Off on Debut Slushy LP “Pastime Gardens” Is Out! Slushy is Chris Kramer and Brent Zmrhal. Pastime Gardens is the first album by Slushy. It is the sound of Chris and Brent playing very loudly in the living room of Matt Riley, who was in the bedroom magnetizing the tapes. We recorded these songs over the course of a few days in December, 2013. Brent was back in town, and he slept on a mattress in the kitchen. It was dangerously cold, and singing songs like “Summertime Girls” and “Fun in the Sun” didn’t make a lot of sense. But now it’s spring and turning into summer, and listening to those songs makes a lot of sense now. There are 14 songs on Pastime Gardens. Some of them are older ones that we’ve been playing live for years. Some of them are newer and we had to work on the arrangements as we recorded. They’re all my favorites. We recorded the band how we play live – Chris playing guitar and singing, and Brent playing kick bass drum, kick snare drum and guitar and guitar pedals. Then we overdubbed more vocals, guitar solos, 12 string acoustic guitar, Korg, and tambourines. We only had 8 tracks, so we were very economical. When we were done we took the tapes to Shimby McCreery, who gave it a mix and a master. Matt Riley also runs Grabbing Clouds Records & Tapes, which released Pastime Gardens on, you guessed it, record and tape. We asked Adam Pezen to do the artwork and just told him the album title. I think he did a very good job. Kriss Stress did artwork as well, for the inner sleeve, and really delivered. Even the vinyl looks nice – a limited run of clear with blue haze, and the remainder on a transparent blue. We hope you like it. You can download the album on our bandcamp or buy the record from the Grabbing Clouds store. Listen to Pastime Gardens with your friends, it’s even better that way. Slushy’s debut long-player Pastime Gardens is now available for pre-order from Grabbing Clouds Records & Tapes! The first 100 come on a clear-with-blue-haze vinyl that is super awesome to look at and hear at! Pastime Gardens was recorded by the cloud man himself, Matt Riley, and mixed and mastered by Shimby McCreery (Five Little Leaves). Snag one today at grabbingclouds.bigcartel.com. Slushy is extremely excited to announce the release of our debut LP, Pastime Gardens, being birthed into this world April of 2014 on Chicago imprint Grabbing Clouds Records & Tapes! Pastime Gardens is the best representation to date of Slushy’s two-piece sound. Taking the direct-to-tape approach heard on the Candy / Pocket single and adding in the wall of sound of Five Little Leaves, Pastime Gardens is a non-stop gooey goodness, the intersecting Venn diagram of maximalness and minimalness. It’s noisy and weird in all the right ways and none of the wrong ones. The album was recorded by Grabbing Clouds head honcho Matt Riley on his Tascam 388, and mixed and mastered by Shimby McCreery, who previously worked with Slushy on “Five Little Leaves”. The album art is by Adam Pezen, with an insert featuring the artwork of Kriss Stress. Update: Some of these songs are pretty good! Email me if you want a copy, I still have a few left! The newest Slushy release is now available for you to get your hands all over. Chicago’s Tripp Tapes is the lucky label that gets to release “Five Little Leaves” a collection of older tunes and fan faves that will make your head spin and heart explode. A limited edition of 100 super-duper pro-looking-and-sounding cassettes has been produced (featuring artwork by GOON$),and are sure to sell like hot birthday cakes. Recorded with Shimby “Live at the Empty Bottle” McCreery, “Five Little Leaves” turns Slushy minimalist, lo-fi rock’n’roll on its head. Featuring drums from The Sleepovers’ Doug Boldon and backing vocals from The Bing-Aires, these five songs are full-on power-pop, doo-wop, doncha-stop action. Fans of The Soft Boys, Flamin’ Groovies, and The Modern Lovers need to score this tape today. You can now order the “Five Little Leaves” cassette with an immediate digital download from the Slushy bandcamp page, as well as Chicago’s finer record stores. Fun fact! We did these recordings intending to release three different 7-inch records with three different labels, but no one we sent the tunes to ever got back to us so I paid my pal in Florida to make some tapes and slapped the Tripp Tapes name on it without telling James in advance! Sorry about that, James! Double fun fact! There are actually 6 songs on the tape, and it’s my mom’s favorite tape even though it has “I Want To Die Young” on it. Sorry about that, mom! 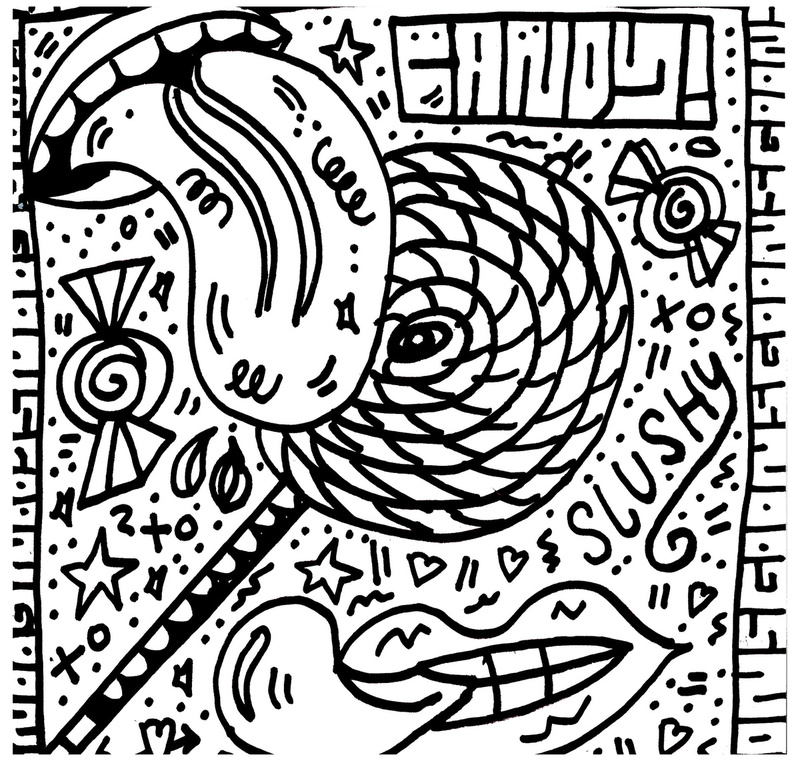 After months of anticipation, Chicago’s Randy Records has released the debut single from Slushy, “Candy” b/w “Pocket”. You can order the single directly from Randy Records. The first 50 orders through the Randy site come with white/orange/pink splattered vinyl. There’s also a super-duper limited edition version that features artwork from GOONS. These are hand-numbered out of 50. They can be ordered on the Slushy bandcamp page. 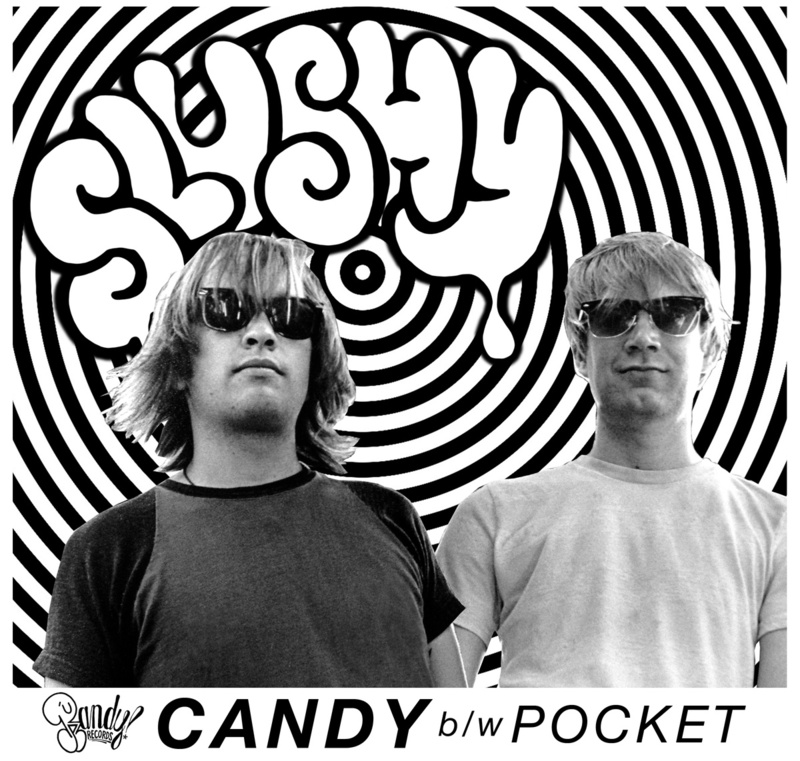 “Candy” is one of the first songs that Slushy ever played. It’s a song about tossing and turning when your mind won’t slow down. The version on the single is different from the version we performed on Chic-a-Go-Go, but man is it good, too. Nathan got a rawer sound that’s more true to our live set-up. “Pocket” is the B-side but it’s the secret hit. It’s a song about having adorable friends. It was only half-written when we went to record, so we faked our way through it, and it turned out great. That solo was done live and it’s not too shabby. The single was recorded by Nathan Johnson in Randy’s Garage and mixed by Joe Montanaro. Photos by Brian Shanely, Slushy logo by Adam Pezen, Goons by Goons, layout by Slushy.